Clew Bay is an ideal location for sailing! Though Seascape is the perfect place to do nothing except relax, unwind and admire the spectacular, ever-changing views, there's plenty to do locally to keep the whole family occupied: surfing, climbing, walking, fishing, horse-riding and cycling. .
Connemara is one of the most beautiful, unspoilt places in Ireland. Roughly bordered by Killary Harbour in the north and Roundstone in the south it features fascinating mountains, lakes, bogs as well as golden beaches. You can reach all sights on easy half-day or day trips from the cottage. 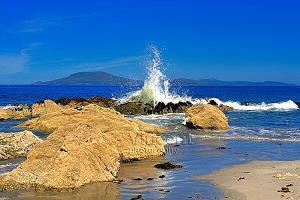 Achill Island is the largest island in the Country and is accessible from the mainland by bridge. Its magnificent sandy beaches and sea cliffs can be visited on a day trip from the cottage. The North Mayo Driving Tour takes you to prehistoric places like the Céide Fields, and to fantastic cliff scenery. If your passion is walking, climbing or just generally 'rambling', then this is the perfect destination for you! The Killeen Heritage Loop Walk passes near the house; numerous other very interesting walks to discover are in and around Louisburgh. 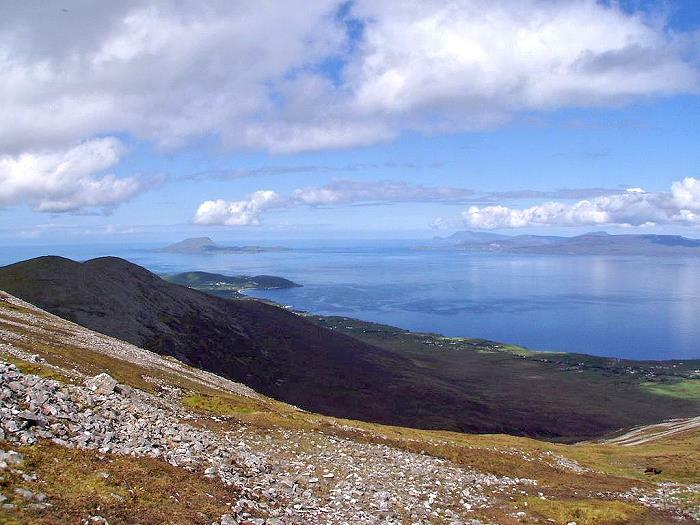 Carrowniskey and Cross beaches have majestic views of Croagh Patrick, Mweelrea, and the islands of Clew Bay and are also perfect for long walks. Croagh Patrick is Ireland’s pilgrimage mountain and attracts thousands of walkers year round; its conical summit offers outstanding views of Clew bay & the islands. The shortest and most well-known route up 'The Reek' starts from the large carpark in Murrisk at the R335. However, if you want a much quieter and more enjoyable route its infinitely better to come along the ridge from Ben Goram to the west of the mountain and not far from our cottage! Mweelrea is the highest mountain in Connaught (814m), and a short distance to the south of the cottage. It presents magnificent scenery from it's summit, but is a mountain which must always be treated with respect. In poor visibility good navigational skills are essential. 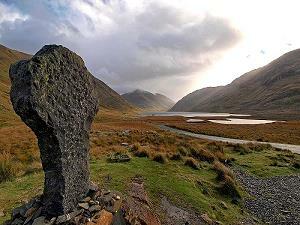 There are two major ascents, one from Doolough (Delphi valley) in the east, the other one from the west starts at Dadreen a few kms south of the cottage. For more hiking & cycling tracks in Mayo please visit the Irish Trails website! Only a few minutes from the cottage are two adjoining sandy beaches, Carrowniskey and Cross. 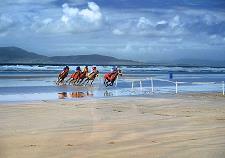 Carrowniskey beach is one of the most popular surfing beaches in Ireland. It has a car park and changing facilities, and, most important of all, a lifeguard on duty during the summer months. 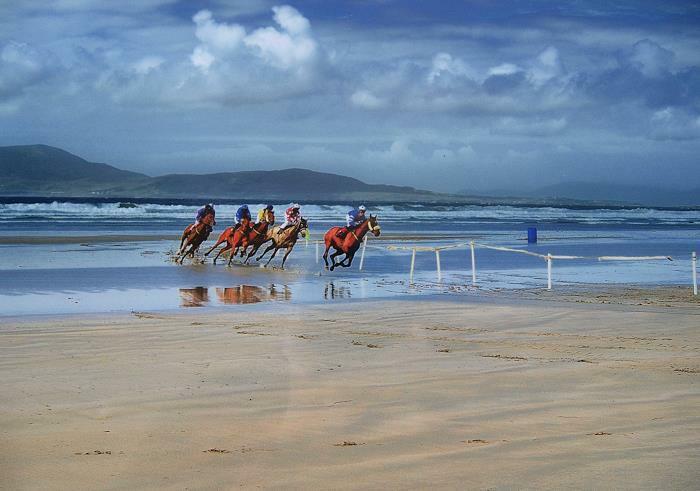 The beach is the home of Carrowniskey Horse Races one Sunday every July which has lots of entertainment for all the family (see picture on this page). To the south Silver Strand and the adjoining Doovirla Beach are among the most picturesque in County Mayo, sheltered by rocky headlands and high sand dunes and are popular beaches for families. The sheltered strands offer magnificent views of Inishturk island, Inishbofin and Clare Island.